Brothers Robin and Lorenzo Etherington are the creators of Monkey Nuts, YORE!, Baggage, Malcolm Magic, Tusk and MOON. They have also worked on The Dandy, Transformers, Star Wars, Terminator Salvation, Wallace & Gromit, Dreamworks’ Monsters vs Aliens and Madagascar comics. Based in Bristol, the brothers visit schools all over the UK, delivering workshops which encourage creative free-thinking in young children through the medium of comic art and story telling. The Etherington Brothers’ comic workshops are educational in content, fun in presentation and flexible in format. Primarily aimed at age 7 – 11 years (though equally appealing for attending parents and teachers) they specialise in engaging with class-size groups. The duo explain the processes behind creating original characters, worlds and stories through example, exercise and Q & A sessions. Humour – a prominent feature of the books – forms a large part of the presentation dynamic and is employed throughout the workshops to encourage a relaxed environment free from criticism. Using a wealth of examples taken from their own work and suggestions from the audience, the brothers demonstrate how story-starting shortcuts can bring words and art to life. From genre-splicing to original characters, from world building to giving your heroes and heroines genuinely life-threatening choices, this is a workshop that takes the audience to the very heart of original storytelling. – Multiple methods for kick-starting the imagination, allowing the audience to instantly jump into the creative process. – How to twist everyday storytelling elements into something genuinely original. – The importance of consequences and how they help shape stories. – How to keep stories exciting by adding or removing key elements, such as parachutes, at crucial moments! Using their critically acclaimed book, “Baggage!” as the basis for a mind-expanding workshop, the brothers share the six steps to making incredible comic adventures. Guaranteed to send young imaginations soaring, with countless art and writing tips and tricks. – How to create original motivations for heroes and villains. – The role that time, details and culture play in bringing fictional worlds to life. – The untold amusing mysteries and tall tales hidden in every pile of lost property! Welcome to the first adventure from the Isla de Monstera, home of the world’s only tap-dancing, banana-loving, rust-fighting, coconut-talking, and crime-busting organisation… Monkey Nuts! When a mysterious signal begins to drive the local loonies into a crazy rage, Sid, Rivet and Chief Tuft have no choice but to grab their masks and get heroic! ‘The exuberant Etherington Brothers dazzle in their opening episode.’ Paul Gravett, author of Great British Comics. Ten-year-old Don Skelton never imagined a school day could get any worse than drowning face down in a bowl of oxtail soup. But he was WRONG! Transported to the spooky underworld of Broilerdoom, Don is soon forced to fight for his life-after-death against a host of villainous monstrosities. A super puzzle adventure comic starring Von Doogan…and YOU! The Curse of the Golden Monkey is both a brilliant puzzle book and a thrilling adventure story. It’s jam-packed with challenges for you to solve, and every step of the way our hero’s fate is in YOUR hands. Can Doogan uncover the mysterious and terrifying secrets at the heart of Javasu Island? It’s up to YOU! 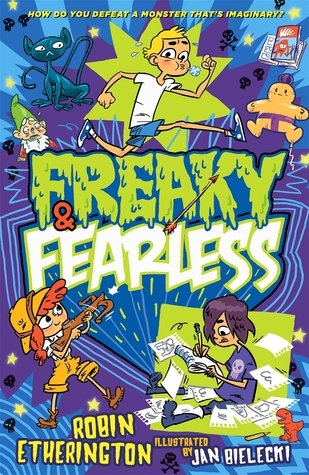 The Freaky comic world collides with three Fearless kids in an explosion of fun, action, laughs and adventure! A magical, hilarious and highly-illustrated adventure perfect for fans of Tom Gates and Dork Diaries. To purchase the Etherington Brothers’ books, click here.